what ereader should I get? Those of you who’ve been following me for a while will know I’ve been eying Barnes and Noble askance for some time. I’ve taken major issue with their website thanks to their last round of changes, enough that I haven’t bought an ebook from them since. And I’ve also been looking askance at some of the changes they’ve been implementing in their brick-and-mortar stores as well. Why did I buy another Nook tablet? Given this, one would be justified in wondering why exactly I’d want to pick up another tablet from them. Simple: I wanted to upgrade from using the last tablet I’d bought from them, the Galaxy Tab 4 Nook, because it was still stuck on Android KitKat and I wanted something with a bit more power to it. Thanks to the credit, not to mention the VISA gift card I’d gotten from the day job as my last work anniversary gift, I was able to get a new tablet from B&N more cheaply than I could from anywhere else. And even though I find Samsung frustrating in how long it takes them to deploy upgrades to the Android operating system, I did like the Tab 4. After playing around with an S2 in a B&N recently, I decided I’d probably like that tablet, too. Which, at the end of the day, pretty much means I liked the idea of having a new Samsung Galaxy tablet more than I disliked buying anything else from B&N. So there ya go. So here’s what I like about the S2. You can take this as you like, if you want to consider buying a Samsung tablet–whether via B&N, via Samsung, or via some other vendor. One, I like the size. It’s not quite as big as my iPad, and it’s ever so slightly lighter, which means a bit less weight in the backpack on the commute. And that’s always a good thing. It’s a little bit bigger than the Tab 4, but that’s offset by how it’s also thinner. Even with an 8-inch screen, it’s still well within the range of device sizes that are comfortable for me to handle. Two, the processing ability is better than the Tab 4. Which means, for my purposes, that’s it’s a better gaming tablet. So I can happily play Gummy Drop and Dungeon Boss on it. Sometimes with both running at once, similar to what I can do on the iPad, a trick I don’t think I could have pulled off on the Tab 4. Three, the adaptive screen is kind of neat, though I don’t know how much of this functionality is the tablet and how much of it is coming in with Android Lollipop. By adaptive screen, I mean that there are settings that can automatically adjust the brightness and color saturation for certain apps under certain conditions. I’ve actually turned this off since I find that it makes Gummy Drop and Dungeon Boss both look over saturated–but I appreciate that the tech is there. There are other settings I’ll have to try on it, like Reading Mode. Four, it comes by default with 32GB on board, which means I no longer have to rely upon having an SD card in the device to carry a suitable portion of my digital library with me. Which also means a bit of a performance improvement as well, since the OS doesn’t have to read stuff off the card. I’m not planning on using this as a device to watch movies or TV–that’s what I’ve got the iPad for. (All the video I buy is on my Apple account, anyway.) So I can’t really comment on whether this device would be good for that. If I get a chance to try that out, though, I will update this post with that data. It was super-easy to get my previous apps back onto it, I’ll have to give it that. This is all on Google, though, since the Tab 4 had been backing up to my Google account. So when I set up the S2, it was all “OH HEY do you want me to restore everything from that backup?” So props for that. The S2 came bundled with Microsoft Office apps for Android. To wit: there are now Microsoft Office apps for Android. And a bit of playing around with Word showed me that the free apps, even without an Office 365 subscription, will finally let you actually do things like edit and save documents. And, they’re even acknowledging the presence of other cloud services besides Microsoft’s. The Word app on this thing seems perfectly happy to talk to not only OneDrive, but also Google Drive and Dropbox. And once I actually opened one of my manuscript files in it, I found out that the free app does actually give me access to the Track Changes functionality of Word. Which, aside from the ability to just write and save documents, is what I use Word for. All of which tells me that I could actually write on this thing in a pinch. Whether I’d want to edit on it without an actual keyboard is another matter entirely, though. To date, I’ve found that if I need to edit a story, I really need a full keyboard and mouse pointer to do it smoothly. Since this is a tablet I expect to be carrying around on my commute, I did actually buy a cover for it as well from the B&N store I went into. 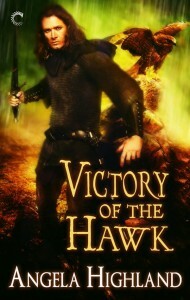 Sure, it’s a Nook-branded cover, but I did like the color scheme on the one I chose. It lets me look at the tablet in both orientations. And it’s got a nice little magnet flap to hold the thing closed. Should you buy this tablet? So far it seems lovely to me, a reasonably small, light device that nonetheless has a decent amount of power for what I need it to do. I’d say that if your device needs are similar to mine, this one’s worth looking at. Should you buy it from B&N? That’s another matter entirely. It’s worth considering if you have an older Nook you can trade in on. But if you’re not already a B&N customer, you may well be better served buying directly from Samsung or from other stores near you that sell electronics. Since I got a bonus from work, I have elected to add another ereader to my collection: this time, one of the new Samsung Galaxy Nooks from Barnes and Noble. Since I’m an established B&N member, I was able to get one at a bit of a discount, and the devices were on sale aside from that this past weekend as well. So I got one for considerably cheaper than normal. Y’all may recall that I acquired a Nook HD not terribly long ago, and by and large, I rather liked it. And for those of you keep score, I have a Kindle Fire HDX too. So how does the new Samsung Nook 7 stack up against those? So this is kinda lollertastic: Dara and I have a credit card that we’ve had via the University of Kentucky credit union, pretty much ever since Dara graduated college. This card generates points that we can trade in for swag every so often, a thing we tend to forget about. Recently the card folks reminded Dara that she’d accumulated a LOT of points, so she and I blew a bunch of them on getting some stuff. Here now are my thoughts on this device, behind the fold! 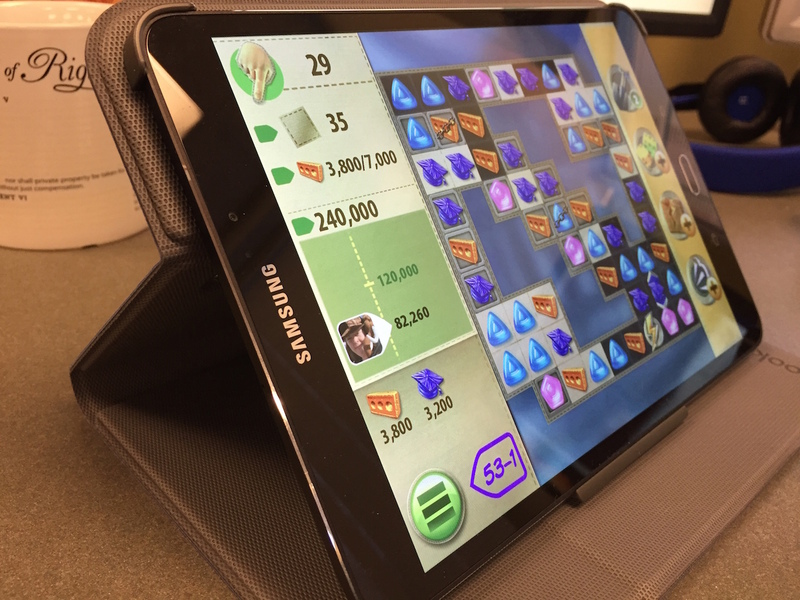 As y’all know, my day job is QA Engineer at Big Fish Games. But what you may not know, even if you’re a regular player of our stuff, is that we’ve been pushing out hard into the mobile arena–and that now we have not only iOS games, but Android games as well! I mention this because a) that shiny new Android page of ours was tested by yours truly (woo! ), and b) since we’re having more of an emphasis on Android devices at work, I felt it was time for me to acquire one. We have a store of devices to use to test on when I’m at work, but I periodically do work from home. Therefore I wanted a device around to have handy in case I needed to test on it. Which raised for me the question of what to actually get. So far I’ve had experience with Nexus and Samsung devices, neither of which really stood up and said “buy me”. What I ultimately decided upon was a thing that’ll be useful to me not only as a testing device, but also as an ereader and a tablet: a Nook HD. This is the smaller, 7-inch version of B&N’s current tablet, which I wanted because that particular size is more comfortable to me for reading purposes, and also because I’ve got my still-perfectly-delightful iPad covering the larger 10-inch form factor. It was rather fun going into the B&N at Pacific Place downtown, where I started experimenting with one of the display models, with my srs bznz Testing Face on. The staffer in charge of selling Nooks took a moment to lock in on me–he was busy delivering his “so, are you interested in buying a tablet?” spiel to another customer when I walked in. But it didn’t take him long to get over to me to start the same spiel. At which point I promptly spieled right back at him as to what I wanted the device for (i.e., web page testing as well as reading, and why yes, I AM a current Nook customer), and to his credit, he immediately went into “oh okay this is an informed consumer” mode. So he cheerfully let me be as I gave serious thought between the smoke-colored model and the white one, and whether I wanted 8GB or 16GB. Final verdict: I got the smoke-colored, 16GB one. This is what it looks like. I keep seeing a lot of people hitting this post, so for the benefit of those of you who’re coming by to see what I had to say about the two devices, I wanted to note a couple of things that I saw about the Mini since I made that post. One: I have a really big ebook collection, and when I tried to put my Kobo books (of which I have about sixty or so) as well as all my books purchased from other sources (e.g., Carina Press) onto the device, it slowed down considerably. Enough that it became kind of unusable. Workaround for this: I’ve since shifted to using the Mini to read stuff I buy from my Kobo account, and putting everything else on my more powerful Nook SimpleTouch. Two: The Mini does not have an SD slot in it. So if like me you have a really big ebook collection, you may wish to keep this in mind. You may want to be looking at one of the more powerful Kobo devices instead, like the Glo or the Arc, if you want to have a Kobo device. Workaround: Same as above, really. Minimizing the number of books I have on the device helps. Also, I’m using the Mini’s archiving ability to immediately archive a book as soon as I’m done reading it, so as to clear it off the device. Three: I noticed periodic frustrating weirdness with the Mini losing track of what book I was reading, and/or how far along I was in it. I suspect this was buggy behavior in its autosyncing up to Kobo’s servers. Workaround: Unless you absolutely need it, turn off the device’s wi-fi. I saw this problem go away as soon as I did that. The drawback here is that I do have to remember to plug the thing into my computer’s USB port to keep it synced, and I can’t really autosync from it over to, say, the desktop app or the app on my phone. But I don’t find that to be a problem. ETA 6/19/2013: Hi, everybody who keeps hitting this post from search engines! Gracious, there are a lot of you. I’ve been seeing this post get something like 8-10 hits a day for a while now. So y’all say hi, won’t you? If there’s anything I don’t talk about in this post that you’d like to know about, or anything you’d like me to post about in a future post series on how to read ebooks, drop a comment and let me know! ETA 6/20/2013: Also, if you haven’t seen this post yet on a few followup remarks I’ve got on the Mini, go check that, too. Third Place Books, my indie bookstore of choice, has joined up with a bunch of other US indie bookstores to sell Kobo ereaders. And since Third Place currently has the Mini on sale for Valentine’s Day, I decided to scarf one and play around with it. This is partly an experiment to see whether I want to commit to making Kobo (and through them, Third Place) my primary ebook source, but it’s also general geeky interest in comparing ereaders. The Nook so far has been my only e-ink device I’ve had firsthand access to; I was quite interested in playing around with another one, just so that I can speak with at least a little more authority on what the various devices are like. My first impression on pulling this thing out of the box is ZOMG tiny. It’s even smaller than the Nook and lighter as well. Weight-wise, it even feels lighter than my iPhone 5, though that may change once I find a cover for it. Setup was super-easy. All I had to do was plug the thing into my computer with the provided USB cord, point a browser at kobosetup.com, and download their desktop app. 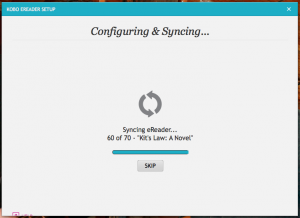 Then, running the desktop app, I had to log in with my Kobo account. But what if I want to click on Help? Sideloading was just as easy as with the Nook, since I just had to launch Calibre and send files to the device, the same way as with the Nook. Also, Kobo’s site Help does confirm that you’re able to just drag and drop files directly onto the device if you want to. The Kobo Help says this thing talks epub AND PDF, so I tried sideloading a PDF onto it as well as an epub. That worked just fine. I suspect though that this device would have the same issue that the Nook does with a PDF–i.e., that even if the device can read a PDF, depending on how it’s formatted, it may or may not look nice on the screen. The PDF I tried came through with the text showing up really tiny. 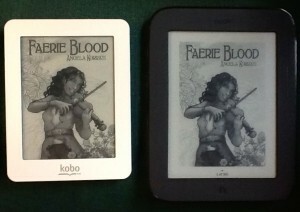 Comparing Faerie Blood on both devices, Dara and I find that the Kobo renders the cover ever so slightly more smoothly. I’m also seeing that the Kobo device is a bit weirder about rendering the centering of the title page–it looks good on the Nook but a bit weird on the Kobo. 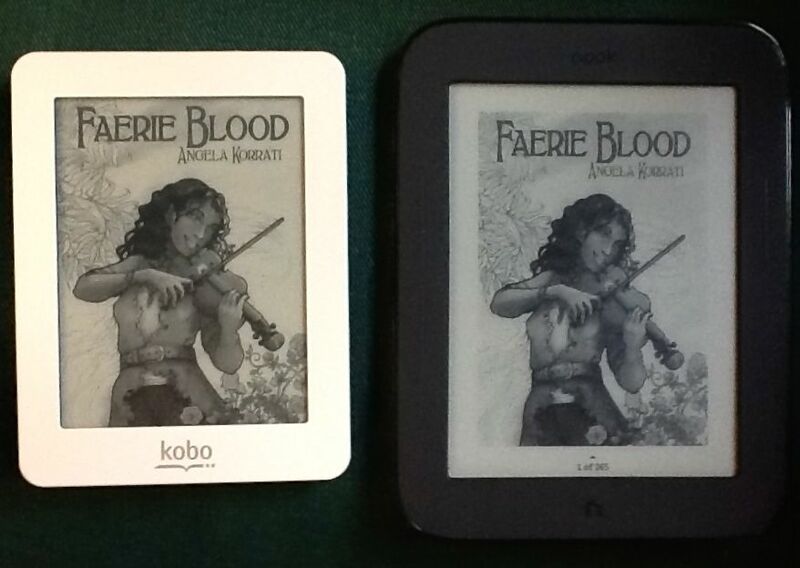 Response time seems to be slightly better on the Kobo but not enough to really notice. So far I’m liking the page transitions a bit better, though. Not as much obvious screen flash, and you can adjust the settings as to how often it does a full screen refresh. Right now mine’s set to the max of every six pages. You can make custom shelves on the Kobo, like you can on the Nook. I note with pleasure that the shelf functionality on the Kobo includes the ability to let you search for specific titles or authors or keywords, when adding books to a shelf. This is extremely helpful if you don’t want to have to page through dozens of pages of books, as you would have to do in a library as large as mine. I also note that if you kick over into the mode that shows a list of books rather than the cover grid, the books will show whether they are Read or Unread. COOL. I don’t see a way to make a shelf of books that are Read or Unread, but if there’s a way to do that, that would be awesome. I notice that if you connect the device to your computer via USB, you have to remember to tap the Connect button on the screen before the computer acknowledges its presence. That’s an extra step to take that you don’t have to do on the Nook. And hmm. As I add more books to the device, the response time slows down a bit. So yeah, it’s pretty much neck and neck with the Nook. I’m seeing some screwiness in metadata on the Kobo that I don’t see on the Nook–some titles coming through in all caps, and one or two books that came down off my Kobo library that don’t have a known author shown. But that, I think, is a question of the store not being quite as thorough with its metadata as the B&N store is. Overall though my impression of this device is positive. I’d say it’s a decent competitor with the Nook SimpleTouch, if you’re in the market for an e-ink device. Anybody have any specific questions about either that you’d like to me to clarify, let me know! I’ll be happy to post updates in the comments or in future posts. ETA: Ooh, this is an important thing to note. The Kobo Mini talks more file formats than the Nook does. To wit, it understands mobi, txt, html, xhtml, and rtf. VERY good to know. I’m not normally one for needing to get the next revision of a device I own as soon as it comes out, but in the case of the new Nook Simple Touch, I’ve made an exception. I was interested by it as soon as I heard it was coming, and what finally pushed me over to get a new one was discovering that the software on the original Nooks (now called Nook 1st Edition) is not going to be updated any more after the current rev, 1.6. So I went out and grabbed one of the new Nooks yesterday. And I’ve gotta say, if you’re interested in the Nook at all as your reader of choice, the new one is a significant improvement over the old. It’s smaller. The actual screen size is comparable, but since they’ve lost the clunky color touchscreen on the bottom, the overall device is noticeably smaller and a bit lighter as well. This is a win, given all the stuff I typically carry in my backpack. It’s a full touchscreen device now. This was one of the things that always confused me about the first Nook–I’d keep forgetting that I’d have to tap on stuff in the bottom area to navigate around on the device, and would try to tap the e-ink portion of the screen instead. Now you can do that. And so far I’ve found it satisfyingly responsive, especially when turning pages, which actually works a bit better than the page-turning buttons on the side. Big big big win: they’ve combined the B&N and non-B&N book lists. So now all your B&N purchases and all your sideloaded content show up in the same overall index. This means that the Shelves functionality is now much less stupid. I’ll actually use Shelves on it now. They’ve ditched some of the superfluous stuff from the first Nook, like the “Nook Daily” icon I never read anything on, the games, and the browser. I cared absolutely zero about any of these things. I don’t need my ereader to play Sudoku or let me listen to music; I just want to read books on it. What icons are available now, Home, Library, Shop, Search, and Settings, seem much more intuitively arranged to me. The page turning buttons have been entirely redesigned. They’re a bit harder to press now but given how they’re set into the sides of the device, they should not have the same problem the first generation devices did with the buttons cracking under extensive use. PDB support has been dropped. This was mostly a problem for me since I have a couple hundred titles I’d bought from Fictionwise, which only sells in epub format if the titles are DRM-free. So I had to take Certain Steps to get those titles onto the new device. If you’re not a customer of a site that sells in PDB, this’ll be less of an issue. The Shelves functionality is still not as awesome as it could be. I can’t find any immediately obvious way to add a single title to a shelf; what I have to do right now is to edit the overall Shelf and then page through my entire list of books to find the one(s) I want. Given that I have several hundred books on the device, this takes a while! So they really need to add a way to just click on the options for a single book and choose what shelves, if any, you’d like to add it to. If you actually liked the segregation of B&N and non-B&N content, you’ll have to recreate it manually yourself via Shelves. Which, given the previous point, may take you a bit. There were times that I actually kind of liked having the lists separate, just because I like to keep track of what books I bought from what site. While much is being made of the improved screen contrast on the new device, so far I haven’t actually noticed much of a difference. I need to compare in different light conditions though, given that the only place I’ve compared so far was in my usual corner of the couch in the living room and that’s one of the dimmer parts of the house unless the lights are on. More on this as I have it. This device doesn’t talk 3G, so if that’s a dealbreaker for you, be aware. It’s wi-fi only. Better selection of fonts for displaying a book’s text. The old Nook had only three to choose from; this one’s got six. There’s new social networking functionality that lets you hook into your Facebook or Twitter accounts to share data about what books you’re reading. You can also import Google contacts onto it. Relatedly, there’s also a new “Nook Friends” thing they’re setting up where you can make a little social network with other Nook-owning friends. This is supposed to let you see each other’s reading lists, lend books, and such. This will be interesting, I think, only if it means you can loan books more than once. One of the biggest complaints I’ve heard from ebook readers all over the Net is the stupidity of being able to loan a book just once; I hope they have addressed this. I haven’t found out yet though. The settings for connecting to a Wi-Fi network seem better laid out; it was a lot easier to see what networks the new Nook had already memorized. So overall: a significant win, I feel. solarbird and I will probably amuse ourselves with rootkitting the old Nook, unless somebody expresses interest in buying it off of me; if anybody wants to, let me know!